1. What is the National Mall 3rd Century Initiative? Who are its members? Who runs it? The National Mall 3rd Century Initiative (formerly the National Mall Conservancy Initiative) is a project organized and funded by the National Coalition to Save Our Mall, a non-profit 501(c)(3) citizens organization founded in 2000 and supported by contributions from citizens across the country. The 3C Initiative is the logical outcome of the Coalitions 2002 State of the Mall Report (posted at www.savethemall.org) that warned of threats to the physical and cultural integrity of the Mall. The 3C Initiative seeks ways to avert these threats and to increase public understanding, use, and enjoyment of this unique public space, this symbol of our democracy. 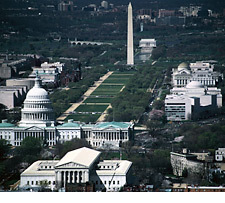 The 3C Initiative was launched in January 2004 at an open public forum, "The National Mall: The Next 100 Years." The forum was hosted by George Washington University, with panelists from two successful models -- New Yorks Central Park Conservancy and the San Francisco Bay Areas Golden Gate National Parks. Three public workshops examined Mall issues in greater detail. Participants, all volunteers, brought professional skills and many perspectives to the task. They were, however, united in their dedication to enhancing the vitality of the Mall as the nations premier "peoples place." The product of the workshops is the report: The Future of the National Mall. 2. What is the mission of the 3rd Century Initiative? How would it function? The mission of the 3C Initiative is to renew the vitality of the Mall through creative public use and wise stewardship for the next century. It would work with Congress, the public, and government agencies with jurisdiction over parts of the Mall. The 3C Initiatives work is a direct response to Congresss efforts to protect the Mall from overbuilding and misuse. Public education, building a national constituency, and developing a long-range vision are important tasks that lie ahead. Preserving the Malls historic concept as the embodiment of our evolving democracy, and enhancing it as an inspiring public space with a sustainable ecosystem, are vital to the mission. 3. Today at least six government agencies have jurisdiction over parts of the Mall. Is a single administrative authority needed? If so, which agency should lead? What role could the 3rd Century Initiative play at this time? We find a strong parallel with the structural problems identified last year in the 9/11 Commission Report. Once again we see diffuse management among government agencies and dispersed oversight by Congressional committees. Here, too, we would expect formidable turf battles, especially if one of the current managers or one committee were to be given full authority over the others. As the 3C Initiative ultimately envisions a Conservancy for the Mall, it would address the turf problem by bringing together the stakeholders  government as well as the public -- in a cooperative environment. It would identify needs and gaps in current Mall administration and develop collaborative projects and plans to fill them. By facilitating this process, the future Conservancy would help the parties do a better job of managing and planning. The workshops identified an immediate need for public education and orientation projects for the Mall. In response, the 3C Initiative has published and distributed an extremely popular brochure and map of the entire Mall - the first of its kind to link all monuments, museums and open space with a brief outline of the historical significance of the National Mall. In addition, the 3C Initiative has begun preparations on a 24-hour Mall information website. The workshops also revealed a disconnect between city government and the Mall that needs to be corrected. It is clear that two problems -- disparate management and pressure for more construction despite a Congressional stop on such construction -- need prompt answers. The National Mall 3rd Century Initiative addresses both problems. 4. How could an expanded Mall become a vital component of the original Mall, equally symbolic, as with the McMillan expansion? The Mall has a tradition of growing with our evolving democracy. One hundred years after LEnfant, the Senate Park (McMillan) Commission devised an elegant solution to similar problems of split management and shortage of memorial sites. The McMillan Plan more than doubled the Malls size and gave us the Mall we know today. It enshrined the symbolic character of the LEnfant concept by adding public parkland and creating sites for the Lincoln and Jefferson Memorials. Once again, the Mall could grow without losing its symbolic essence. There is an immediate need for Congress to think ahead by addressing the Malls expansion. One way would be to look at adjacent land already identified by Congress, the National Park Service, and the National Capital Planning Commission. These areas in West Potomac Park, East Potomac Park and Haines Point, and the South Capitol Street corridor are illustrated inside the back cover of the Future of the Mall report. Land is limited, costs are rising, and ad hoc projects such as the proposed baseball stadium add to the pressure. The future Conservancy could share its expertise with Congress to help identify what lands may be needed to realize the expansion of the Mall into a "3rd Century Mall." A 3rd Century Mall would reinforce the democratic principles embodied in the "first" and "second" century Malls of LEnfant and McMillan. For example, future commemorative elements or museums, as well as their landscaping, would convey civic meaning and function, as the Lincoln Memorial did for Potomac Park. They could also anticipate new uses that arise from a changing society. Similarly, a 3rd Century Mall would embody the design principles of todays Mall. The historic LEnfant and McMillan Plans are rooted in the grand boulevards and formal gardens of Renaissance and Baroque Europe. Two concepts from that tradition dominate the Malls great open space: (1) frequent visual destinations formed by monumental edifices, sculptures, and water elements; and (2) reduction of scale into discrete territories, embodying different, formal themes. How might a 3rd Century Mall take shape? One answer would be to lay out the new areas around a series of monumental hubs and connecting pedestrian/vehicular links. This would create destination sites for new commemorative elements or museums and open up crucial vistas and circulation routes within and between the various areas. South Capitol Street and East Potomac Park could be linked by a new bridge across the Washington Channel, thus creating a flowing experience from the Capitol to the Lincoln Memorial. Planning for the general character of the interstitial parcels could follow. A 3rd Century Mall would not only relieve pressure for further building on the original Mall, but would gain enormous caché as the location of choice for important new monuments, museums, and other hubs of civic and recreational activities. 5. Might the 3rd Century Mall showcase modern sustainable science and practices? The neglected ecosystem of todays Mall cries out for attention. One way to pull together the Malls disparate needs for the future would be with the theme "the health of the Mall"  a concept that would encompass the Malls natural and man-made elements, as well as public use. Guided by the precedent of the McMillan Commission, whose "City Beautiful" concept set in motion Americas city planning movement, the 3rd Century Mall could showcase American genius in all aspects of modern park stewardship, in particular, sustainability. Public use of the Mall for large crowds and major events has exploded in the past fifty years. This mounting problem takes a toll on the heirloom trees and grass, as do new memorials, barriers, and multiple forms of security construction, much of it uncoordinated. The answer lies not in restricting public use, but in better coordination, and in adapting the grass to the people with modern turf technology. New sites eyed for an expanded Mall include waterfront that was once river and wetlands. These are ideal targets for innovative programs that balance human use and nature, and perhaps recover lost water elements with scenic ponds and fountains. Current planning for the Anacostia Watershed and Potomac riverfront could be coordinated with this model of modern ecological science and practice.